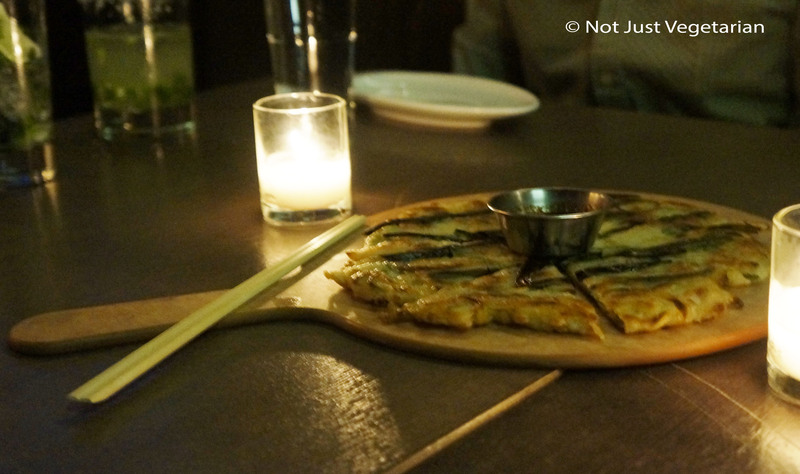 We went to Barn Joo, a Korean inspired Gastropub in the Flatiron district, because I had heard good things about this place serving small plates and Korean tapas. Barn Joo intends to provide the space where people can connect with each other in a pleasing way and that it did. 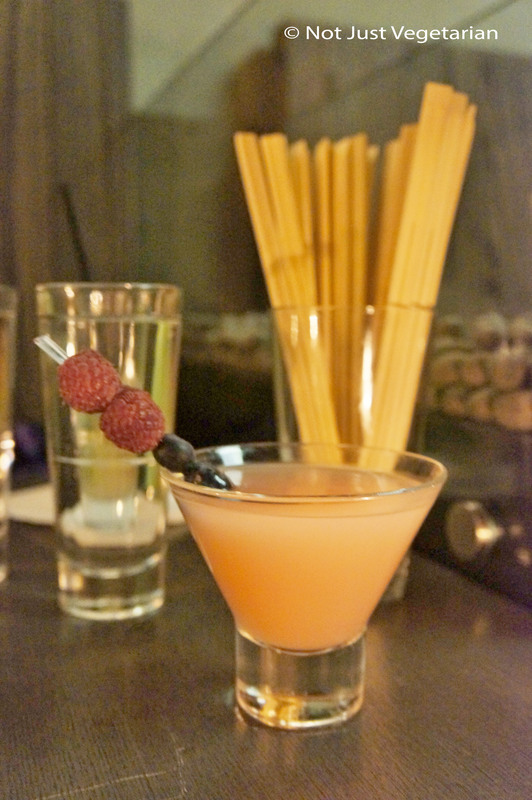 Barn Joo is a large 3 level bar and restaurant in boutique Hotel Verite. The 8,100 square feet space can accommodate large groups – it’s the perfect place to go with a group of friends or family, small or large, and the service was attentive. I wish I could tell you that the food is great and that you should go there; the food has potential, but is average. Nothing wrong with any specific dish, but it just seems to fall short on expectations (or was it just ours? ), especially when Chef Steve Song used to work with Jean-Georges Vongerichten and at Mono Mono (a fried chicken place in the East Village), although I must admit that I liked the fried chicken wings, and I was the only one in our group that liked it. The small plates are really small, but then, they do not cost a lot either. I got a drink called Mak-Geol-Lini and it looked very pretty. The Barn Joo menu says that the taste cannot be described and that its made with Makgeol-li, a traditional Korean rice wine and pomegranate vinegar. I thought it tasted like star anise and / or medicine and it was too intense a flavor for me to enjoy. 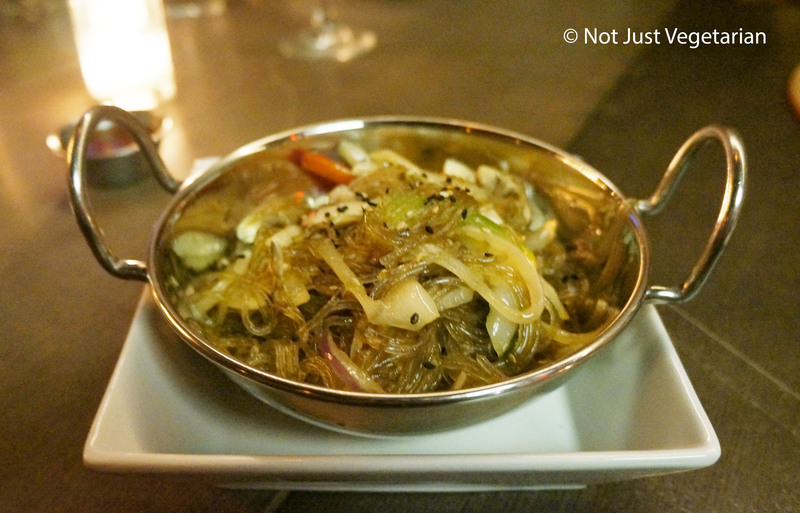 We got the Jap Chae (Korean sweet potato noodle bowl). It tasted good with the few pieces of cremini and shitake mushrooms and vegetables, although we could see several tablespoons of oil swirling at the bottom of the pan. I liked the Buchoo Pa Jeon, a pancake made of garlic, chive, and scallion – it was soft inside, crispy outside, and had a good combination of the ingredients. It was served with a slightly spicy (dipping?) sauce that I liked. Some of my friends thought that the pancake was sticky / slimy. 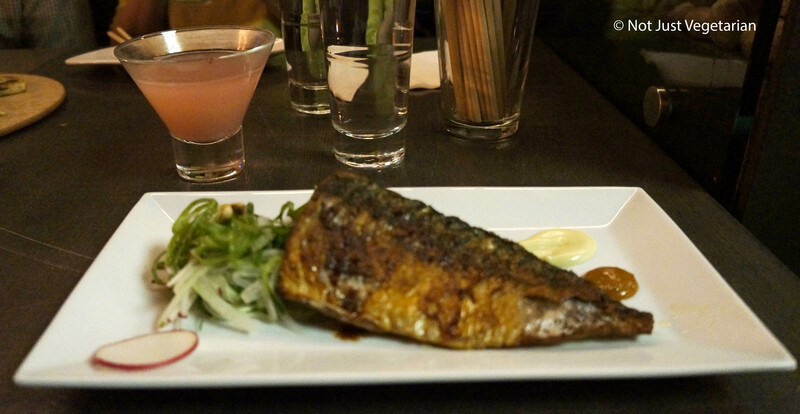 We got a plate of the grilled mackerel (Godunguh Guhee) knowing that a mackerel could smell intensely of the sea. The accompanying salad and kimchi had potential – but we could barely taste any ingredient in the apple scallion salad, or the wasabi mayonnaise, or the caramelized kimchi. This was a dish with potential but the execution did not meet expectations. 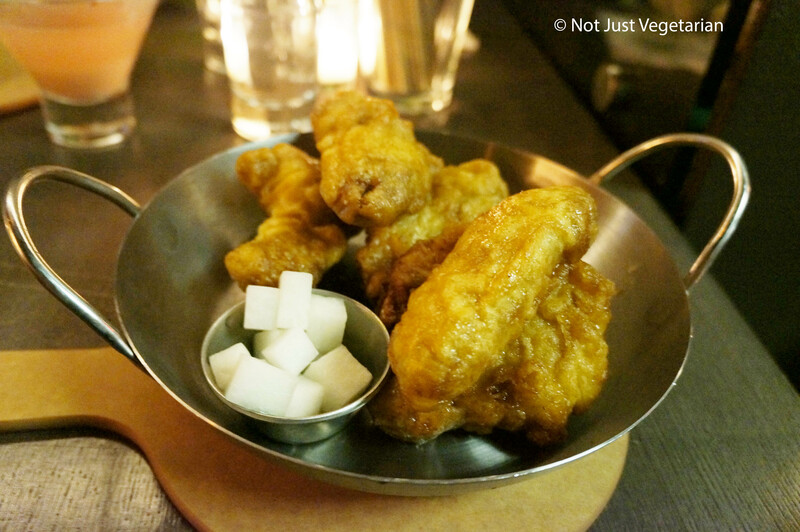 The chicken wings that arrived were deep-fried and it was the best dish of the evening. My friends were not very impressed – they were of the opinion, that anything fried tastes good. I beg to differ, but then…. Anyway, back to the chicken wings, I liked the crunchy exterior and the soft flavorful chicken inside. The diced daikon accompanying the wings was delicious too. The herbed mozarella sticks were bland and leathery. 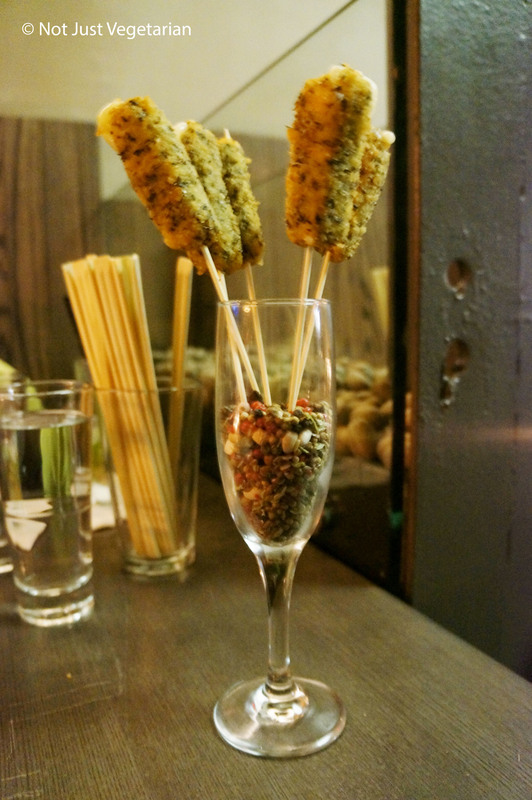 The herbs on the mozarella sticks did little to add flavor. The mozarella sticks were palatable only because of the sweet and spicy sauce that accompanied them. 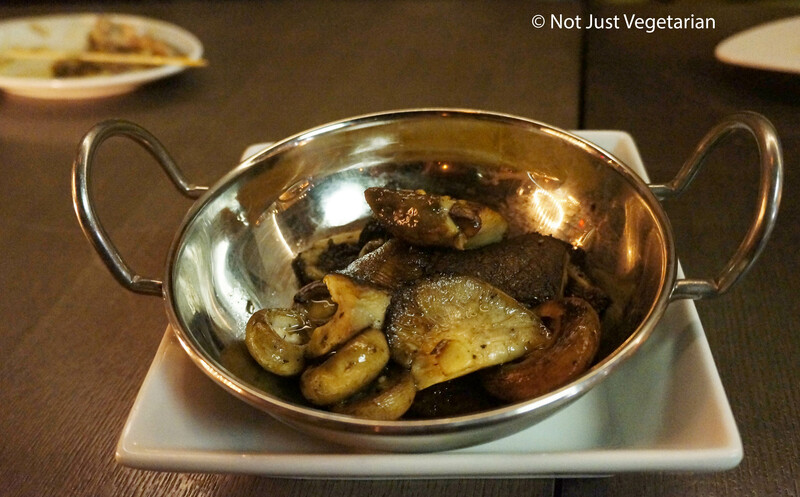 The roasted mushroom dish was average – could barely taste or see the chopped fine herbs or smell the truffle essence. 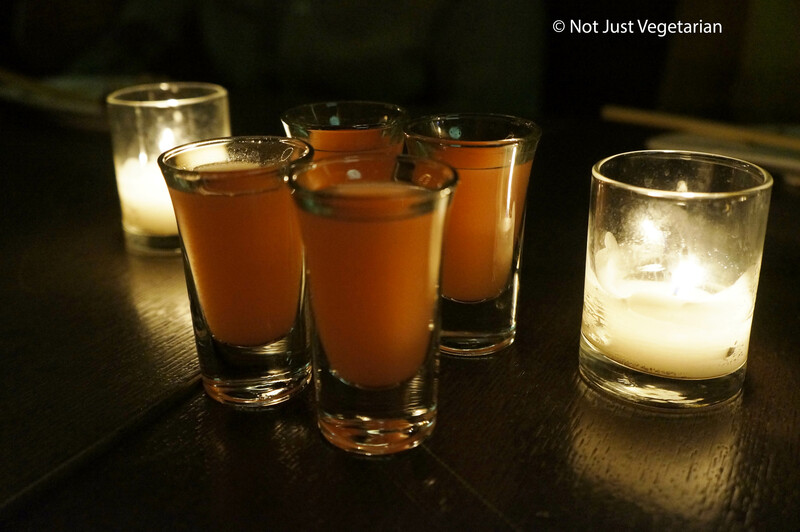 We were given complimentary shots of a new drink that will appear on the menu in a week or two, we did not get the name, but I liked the tangy sweetness of these shots. 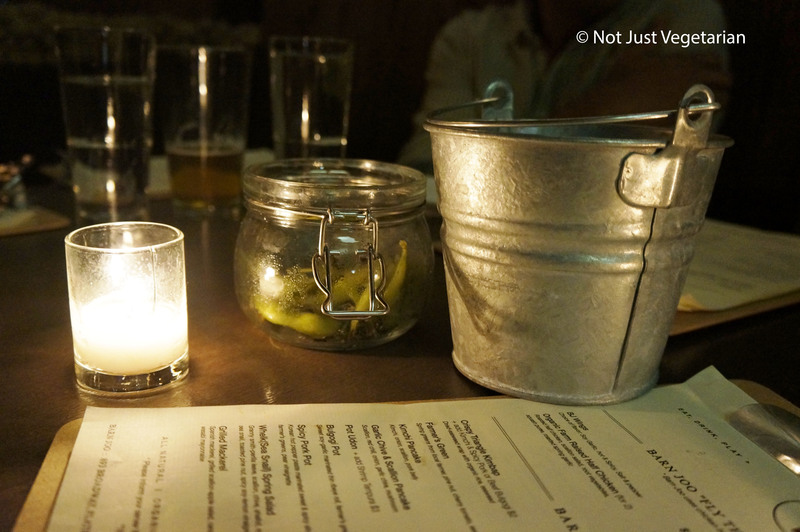 Overall, the menu at Barn Joo has potential and the space is large. It’s on a quiet street in the Flat Iron area. It would be a great place to hang out with friends, although Barn Joo will draw more guests if the food is better. It was empty by 11 PM on a Saturday night and we left wondering if the sole purpose of the restaurant was to provide room service to the hotel guests at Hotel Verite.